The Dow Jones futures are on the rise in pre-market hours as the index aims to reach a 12-day winning streak. On Friday, the Dow gained 11 points in the final few minutes of the trading session and extended its gains for the 11th consecutive trading session. The Dow Jones Industrial Average projected a 11-point gain in pre-market hours. The markets have been growing more cautious on word that the Trump administration may take a while to implement its campaign promises on tax cuts, financial reform, deregulation, and the repeal of "Obamacare." The 11-day winning streak that continued Friday is the best run of daily records since 1987. But the remarkable 11-day rally is drawing comparisons to volatile times in the markets in 1987 and 2000, which has many people asking, "Will the stock market crash soon?" Click here to get the answer. In economic news, investors are keeping an eye on the January report on U.S. durable goods orders. Economists anticipate that the U.S. Commerce Department will report that manufactured goods production increased by 1.6% in January. Crude oil prices were rising despite Friday's announcement by Baker Hughes Inc. (NYSE: BHI) that the weekly U.S. rig count surged past 600 platforms for the first time since late 2015. It's another sign that higher crude prices have fueled an uptick in U.S. production. On Thursday, the Energy Information Administration announced that domestic crude stocks increased by 564,000 barrels. Concerns about increased U.S. production have offset optimism that OPEC members and Russia could surpass their goal of slashing 1.8 million barrels per day (bpd) from global production. The WTI crude oil price today added 0.8%. Brent crude gained nearly 1.1%. Shares of Transocean Ltd. (NYSE: RIG) are in focus after Barron's predicted the stock could rise as much as 35% should crude oil prices top $60.00 per barrel. Money Morning Global Energy Strategist Dr. Kent Moors predicts oil prices could rise another 20% in the first half of 2017. With crude prices set to rise in 2017, we've put together a list of the three top oil stocks to buy. Here are the three top oil stocks to buy this year. But the big news is the busy week ahead for retail stocks. This week, Target Corp. (NYSE: TGT), American Eagle Outfitters (NYSE: AEO), and Lowe's Cos. (NYSE: LOW) will report earnings for the December-ending quarter. Money Morning Global Credit Strategist Michael Lewitt has warned investors that stocks are in a bubble, and nowhere is that more obvious than in the retail sector. Lewitt explains that retail companies are dying because they haven't adjusted to the global shift in consumer demand in the e-commerce space. Not only are traditional retail firms susceptible to sharp downturns in the future, but major brands are also at risk. Michael warns that this major food company is on the cusp of a sharp decline in the future. Read more, right here. Shares of NVIDIA Corp. (Nasdaq: NVDA) have been struggling in recent days after the breakout technology giant received a round of downgrades from Wall Street investment firms. On Friday, NVDA stock fell 9.3%, its largest one-day decline since August 2011. BMO Capital slashed its price target to $85.00 per share. Facebook Inc. (Nasdaq: FB) is within striking distance of a new record high. And while the company continues to generate huge revenue gains every quarter, investors are curious when the social media giant's stock will split. Although a Facebook stock split date still hasn't been announced, we break down why it's poised to happen soon. In earnings news, shares of Perrigo Co. (Nasdaq: PRGO) are in focus. The drug maker will report fourth-quarter earnings in pre-market hours. Markets will be interested in learning about the company's deal with activist hedge fund Starboard Value to explore a sale of its prescription business. 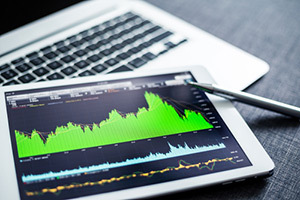 Keep an eye out for earnings reports from Priceline Group Inc. (Nasdaq: PCLN), Workday Inc. (NYSE: WDAY), Hertz Global Holdings Inc. (NYSE: HTZ), Tenet Healthcare Corp. (NYSE: THC), Albemarle Corp. (NYSE: ALB), Gogo Inc. (Nasdaq: GOGO), Frontier Communications Corp. (Nasdaq: FTR), EOG Resources Inc. (NYSE: EOG), and AES Corp. (NYSE: AES). Dallas Federal Reserve Bank President Robert Kaplan Speaks at 11 a.m.